Did you come up with a list of resolutions for this new year? If you did, by now you might be worried about how you will stay on target with your list of resolutions. Maybe you have even forgotten some of them by now? I found a better idea that is more realistic and more personal. I want to share it you today. Be kind to yourself and instead of writing out a list that will be forgotten soon, focus on just one word for the year – let’s see where the journey takes us. ONE WORD will be far more personal and much easier to stay focused on than a big list – won’t it! Think about joining in with people who are turning to God and praying about getting just ONE WORD that will be with you for the 365 days of this year. I just did! You can find the link right here, and take a look and see if this would be something you might like to do. Yes! When I thought about this word, I immediately thought of the Matisse dance paintings in the Barnes Museum in Philadelphia. I cannot think of another image that would better represent what it means to be exuberant; one word that would represent a person filled with exuberance. I think of this word as a noun, as well as an adjective. Matisse understood this word, I am certain. EXUBERANCE…this is my ONE WORD for 2015. This word just came into my mind near the beginning of the New Year, settled in, looked around and decided to stay with me for the entire year. How did this happen? I have no idea how a single word comes to mind and lingers. It’s a mystery to me. What I do know is where it came from, the source of it. It is gentle and yet, persistent, and it whispers to me as I sit a while and have some quiet time with God. The time for silence, set aside, and practiced at the beginning of the day, or any other time apart, is one of my “intentions” for this year. I wrote about my intentions on an earlier blog post. The daily periods of quiet time are when I reflect and experience God’s presence in my daily activities. I speak of exuberance, as a noun. 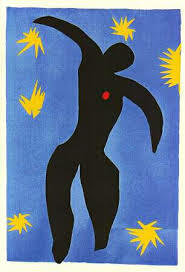 This painting by Hanri Matisse expresses what the noun, EXUBERANCE, might look like. It’s JOYFUL, and delightful, and full of life! 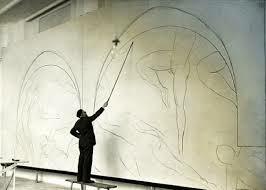 Left: Photo of Matisse drawing on canvas – the beginnings of his paintings of dancers. 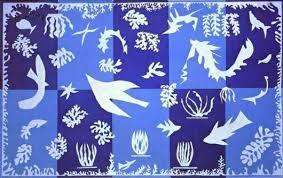 When I think of EXUBERANCE, I think of Matisse! And, then I think about what this word will hold for me during 2015. I will hold it in my mind, envision it in my spirit, recognize it in my prayer life, every day of this year. Today, I am beginning the drawing of it. A year from now we can look back and see what the word we chose has brought to us this year. Pray about this and see what word God has for you this year. What will your finished work of art look like? God is the Creator of the entire universe and we can trust him to create in our lives, something exciting, new, and joyful. Let your light shine everywhere you go this year. Be a picture of JOY, like a painting by Henri Matisse! In all circumstances, yes, ALL circumstances, give thanks to God. This entry was posted in art, christianity, Journal, Joy of Life, Lynda McKinney Lambert, Writing and tagged art, Art History, art therapy, Christianity, enthusiasm, Exuberance, faith, featured, happiness, healing, Henri Matisse, Joyfulness, jubilant, Matisse, Memoir, New Year, One word, Resolutions, writing by Lynda McKinney Lambert. Bookmark the permalink. is another place to explore your word. I love having this focus and have an art journal dedicated to my word! Great post Lynda. Creativity – what a good word to think about every day! My word for last year was “INTENTION” and instead of making resolutions, I thought more about setting my intentions. I will find the site you mentioned – sounds good. Thanks so much. My word, exuberance, is already influencing me in so many ways. Most of all, I see it coming into my interactions with everyone around me. It’s like a burst of positive energy! Thanks, Alicia.